Watch out for them, they’ve been put around the bases of trees on streets, along parts of Chester Rd (around bushes and trees) and at the top of Talbot Rd. I had a meeting this week with the Greenspace Development Officer to talk about the next phase of planting and he is liaising with the relevant departments on our behalf to find out who owns various pieces of land and the appropriate departments to ensure that when our planting begins in earnest next spring it will all be fine. We also had some good news this week. A funding application that was submitted to Stagecoach as part of their Green Week was successful. 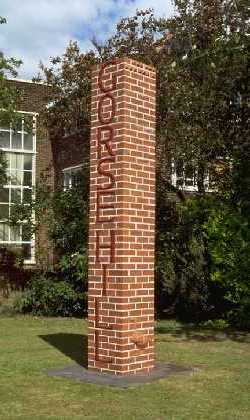 This was specifically to try and plant around the two Gorse Hill Columns that act as gateways to the area. One of them is on concrete so will require planters but flowers and herbs established round both of them with draw more attention and be step further along the road to Gorse Hill gorgeousness. We’ll have more news about the art work soon; this is the largest part of the project which many partners involved. The good news is that we have agreed verbally with two different artists to take on the work. We’re really looking forward to this and once formal agreements have been signed and we hear about two more funding bids we’ve put in we’ll be telling you more. In the meantime I hope everyone is thinking of little ways to make Gorse Hill more gorgeous, be it picking up some litter, fetching bins in on time or planting some flowers in your front garden. Together we will make Gorse Hill Gorgeous! This entry was posted in Updates by Ruth Hannan. Bookmark the permalink.